The ‘Rent or Buy?’ report was featured on RTE1 ‘Drive Time with Mary Wilson‘ yesterday, it was prepared by Dr. Peter Stafford (Independent economist recently taken on by the Society of Chartered Surveyors), Karl Deeter (of Irish Mortgage Brokers) and Frank Quinn (of Senior College Dun Laoghaire). In the report we ran six different future scenarios with a view to determining whether it made better sense to rent or buy a property. The findings are in the report, you can download it by clicking on the image to the left. Our findings were fairly consistent, showing that in almost every future scenario that renting makes better sense from a cost perspective than buying does. The times that buying is better is in an upward only market and a flat market. That may help to put numbers on behaviour, because during the boom people thought prices would go upwards only and it is therefore reasonable to see why so many jumped into the market. It doesn’t get into the deeper causation but it helps to demonstrate this albeit ex ante evidence. I want to give a very big thanks to the other authors, Peter and Frank, without them this report never would have happened, Peter keeps a great blog/site and his monthly macro reports are well worth signing up to check out his site. Frank teaches valuations in Senior College Dun Laoghaire and although he doesn’t keep a site himself, we have been chatting about him contributing on this blog from time to time, the prospects of which we are very excited about! ‘Research on Real Life’ is (in my opinion) the best kind there is, we hope that this report helps readers to make a decision that they may otherwise find difficult to answer, of course, not everybody buys a house based on minimum cost to themselves, if that were the case we’d all cram into bad neighbourhoods and rent there [albeit that paradoxically that would drive up rent prices in those areas! 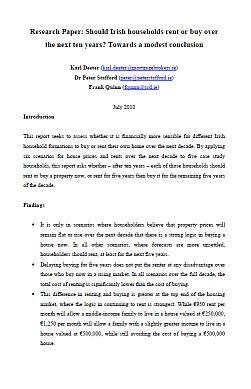 ], having said that, this report should help to debunk some of the property spin you may hear from time to time. 3. The rental price scenario you envisage over the next ten years in terms of % change per year. From there we can let you know the cost of buying now, waiting five years, or renting only for the next ten years. There are some flaws in our calculations as there are in any calculation that makes assumptions but we can tell you about them so you are aware of them.